Commercial truck driving operations in the United States fall into one of two categories: interstate or intrastate. Interstate refers to a trucking operation that operates in two or more states; the commercial truck crosses one or more state lines in transporting its cargo. Intrastate means the operation takes place within the boundaries of a single state. The main difference between the two is how they are regulated and by which agencies. Interstate trucking operations must abide by the Federal Motor Carrier Safety Regulations, or FMCSRs, and federal Hazardous Material Regulations. Operations that transport cargo across state lines are also subject to any regulations and fees of the states through which a truck travels. The federal regulations are established by the Federal Motor Carrier Safety Administration, or FMCSA, an agency within the U.S. Department of Transportation. Intrastate trucking operations are governed by the regulations of the state within which it operates. Usually, these are the same as or similar to the FMCSRs. States are allowed some variances, such as less strict medical qualifications, lower age limits, or more hours on the road for commercial truck drivers. Commercial truck drivers are subject to more and higher fees if they operate across state lines. For example, license plates and insurance are higher for interstate operations, and each state may impose its own cargo fees and charges. Intrastate trucking does not require as many fees, and fees for such items as vehicle license plates can be lower. Fees can vary depending on the type of cargo being transported, as can the fines for not paying the fees. 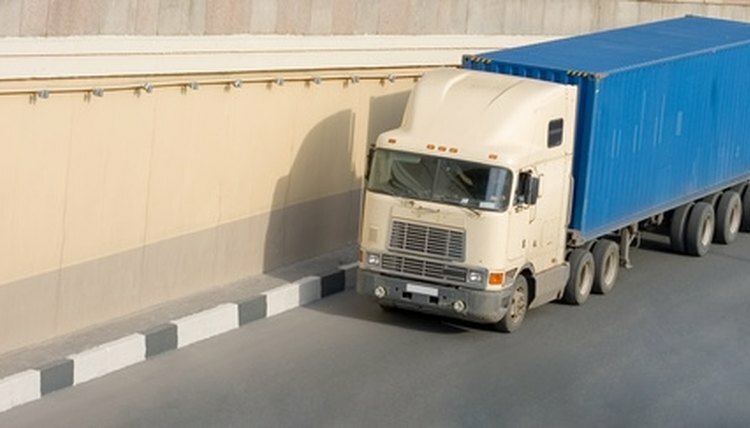 According to the FMCSA, all interstate commercial truck operations must have a U.S. Department of Transportation Number if a vehicle is more than 10,000 lbs., if a driver is being paid to transport nine to 15 people, including the driver, if a driver is transporting 16 or more passengers, or if a driver hauls hazardous materials across one or more state lines. An intrastate trucking operation may be required to obtain a DOT number if it is required by the state in which it operates. Regardless of whether a truck driver operates intrastate or interstate, he or she must possess a commercial driver's license, or CDL, from the state where he or she resides. Each state establishes its own CDL requirements, but there are minimum federal standards that must be met under the Commercial Motor Vehicle Safety Act of 1986. Drivers must pass tests that prove they possess the skills and knowledge necessary to safely operate a commercial motor vehicle. A driver must also pass additional tests to operate vehicles that have air brakes, carry hazardous materials, transport passengers, tow double or triple trailers, or transport gas, liquid, or other material in a tank. S., Gerard. "What Are Interstate and Intrastate Trucking?" , https://legalbeagle.com/6505229-interstate-intrastate-trucking.html. Accessed 20 April 2019.